SALT LAKE CITY — February 1, 2016 — Boart Longyear (www.BoartLongyear.com), the world’s leading provider of integrated drilling services, equipment and performance tooling, is proud to announce TruCore™ orientation system. 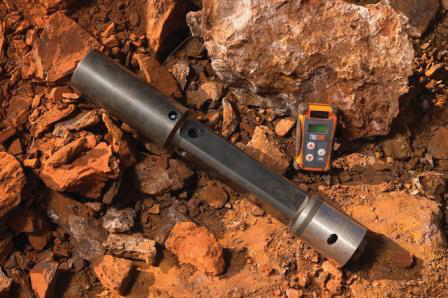 TruCore is Boart Longyear’s first product in its instrumentation line and enables drillers to provide the accurate data and results mining clients count on, while decreasing spend on consumables. When you need accurate data and cannot risk missed orientations TruCore has been rigorously tested to ensure that the handheld device lets drillers know when to activate it. This minimizes the risk of missed orientations. When you need an easy-to-use solution With its highly visible, flashing LEDs, TruCore notifies the user when there is direct alignment, which reduces the total measurement time and makes TruCore the ideal solution for bright daylight, lowlight and underground operations. With TruCore there is no need to disassemble the barrel to obtain an orientation mark. When you need to save money on consumables Additional extensions are not needed when the integrated TruCore housing is combined with Boart Longyear’s outer tubes, reducing the number of joints and high wear on outer tube extension barrels. Plus, Boart Longyear’s extension barrel is made of the highest-quality steel, which reduces the frequency of wear out. When you want to reduce manual handling time and increase safety With TruCore, there is no need to disassemble the core barrel to obtain an orientation mark. As a result, you will reduce the number of manual handling actions a driller or driller assistant needs to perform. When you want an alternative to the current market solution As a trusted supplier of drilling equipment and tooling for more than 125 years, Boart Longyear offers the first alternative solution in the marketplace for core orientation. It is easy to switch and start using TruCore today. Available in sizes BQ™ through to PQ™, TruCore was designed and made in Australia. TruCore is now available to rent in Australia and will be rolled out to other regions throughout 2016 and 2017. To learn more about the Boart Longyear’s TruCore system, visit www.boartlongyear.com/TruCore. About The Core Orientation Process Core Orientation is essential to the Mining & Resources sector as it marks and determines the precise orientation and position of core while in the ground. This information helps determine faults, cleavages, joints, mineral lineation and other geophysical properties, which lead to better mapping for exploration and mine site development. About Boart Longyear Boart Longyear is the world’s leading provider of drilling services, drilling equipment and performance tooling for mining and drilling companies globally. It also has a substantial presence in aftermarket parts and service, energy, mine de-watering, oil sands exploration and production drilling. Boart Longyear is headquartered in Salt Lake City, Utah, USA, and listed on the Australian Securities Exchange in Sydney, Australia. More information about Boart Longyear can be found at www.boartlongyear.com. To get Boart Longyear news direct, visit www.boartlongyear.com/feed.